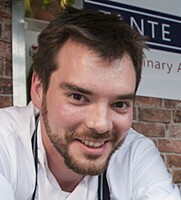 Alex is a Senior Teacher at Tante Marie Culinary Academy. Having studied at Tante Marie himself, Alex went on to gain a position working for the Roux brothers at le Gavroche. An inspired and talented cook, Alex is a fountain of wisdom on all aspects of culinary preparation and presentation, and he works very hard to ensure that his students always prepare and present the best possible food – average is never acceptable. Alex can best be described as focused and passionate about his trade, and he is never happier than when he is perfecting his culinary skills – particularly when it involves butchery, game and fish – or more especially, chocolate!